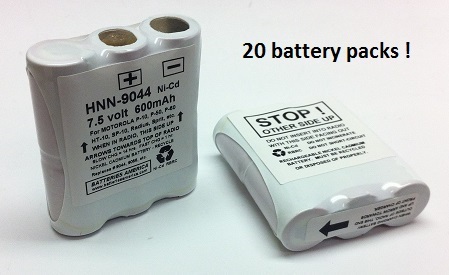 20 pcs of HNN9044 : 7.5 volt 600mAh rechargeable Ni-Cd battery packs for Motorola P10, Motorola P50, Motorola P60, Motorola HT10, MotorolaSP10, Motorola Spirit series, etc. They replace NTN9044A, NLN9044, NTN9056A, NLN9056, HNN9044, HNN9056, etc. These can be recharged while in the radio, OR they can be removed & placed in a direct Battery recharging unit. These battery packs are MADE IN THE USA by BATTERIES AMERICA. Pricing is for 20 battery packs.